The extent of Dr. John Henry Fleming’s literary range is unmistakable in this slight little book. 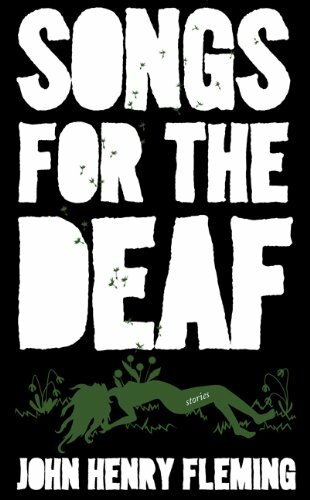 Songs for the Deaf is a collection of 11 short stories with a wide array of subjects that jump from dark to bizarre to poignantly humorous to satirical to heartwarming and then back to bizarre. His writing style also runs the full gamut. Some pieces are high literary fiction, while others fall more into strong character-driven mainstream. Most notable of Dr. Fleming’s stories is perhaps “Weighing of the Heart.” The only piece in the book which is told in first person, this is a magical tale about a man who picks up a floating girl as he drives endlessly and aimlessly along the highway trying to lose the memories of his dead wife and the car accident that killed her. Only this man’s driving is not carefree; it’s rife with memories and tragedies that no one can out drive. In the end these two learn to float along and not alone. Another bright light is the bitterly funny “Chomolungma.” Here a fully dysfunctional family takes on Everest with “discount Sherpas.” Smart, spot-on dialogue is what drives this piece. The father, angry over his wife’s affair, is dragging his family upward toward hell. The two teenage children are priceless: Jennifer, who even as she risks her life in Nepal, can’t leave behind her “vampire make-up” and sulky William, who offers to carry his father’s ice axe not out of consideration, but for the “awesome possibility” to shut his father up once and for all. Also worth mentioning is “Xenophilia.” This mini mini novella is about an alien who remarkably survived a crash landing in a little desert town. “And then, incredibly, the President transferred sole, top-secret possession” of the little creature to a Nobel Prize winning scientist. He embraces the care of this charming alien fully. The ensuing sexual escapades, real and imagined, are a romp of an awesome read. While pieces like “A Charmed Life” (a man’s tragic life is told as he travels back to his hometown to pay his parents’ debt to the midwife who helped bring him into the world) and “Wind and Rain” (a man rehashes their tragic tale with his brother who’s in a coma) slow down the pace of Dr. Fleming’s writing, Songs for the Deaf is a quick, pleasant read—a highly commendable collection of literary short fiction.